Aramark at the University of London has achieved the Bronze Food for Life Catering Mark for their Hospitality Menu at Bloomsbury event venue, Senate House. The Food for Life Catering Mark provides an independent endorsement for restaurants and caterers who serve fresh food which is free from trans fats and controversial additives, and which are better for animal welfare. Caterers are audited to ensure they meet high standards of provenance and traceability, providing reassurance to customers that meals are freshly prepared using environmentally-sustainable and seasonal ingredients. The Bronze, Silver and Gold tiers recognise caterers who serve more locally produced, healthy and organic food. Caterers with the Bronze Catering Mark serve seasonal meals which are freshly prepared and free from harmful additives, trans fats and GM. 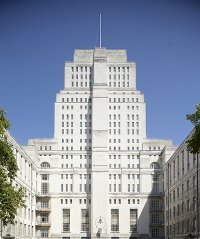 Senate House has cultivated a reputation for event excellence and versatility. The stylish and imposing art deco building is popular as a film and television location as well as for meetings, conferences, exhibitions, private events and live music evenings. Senate House is situated amongst the garden squares of Bloomsbury, at the heart of the University of London’s administration in the West End of London, just a few minutes walk from Euston and Kings Cross St Pancras stations.